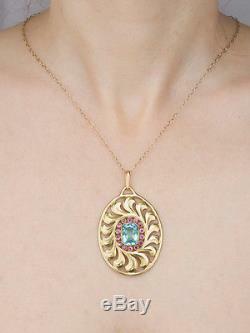 ARTS AND CRAFTS 6.37 Ct AQUAMARINE AND 1.18Ct RUBY PENDANT SIGNED BY PFEIFFER. 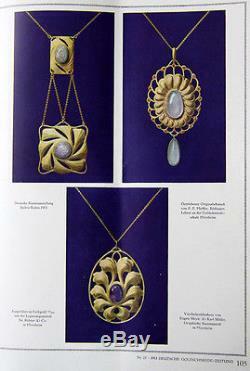 Jugendstil was an art movement between 1890/95 and 1914. The German name was derived from the magazine "Jugend", founded in 1896 in Munich. Was a revolt against stifled art and life forms of the Gründerzeit. 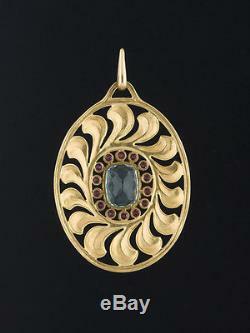 The artists of the art nouveau sought a new beginning at the sources of art, which they recognized in nature. 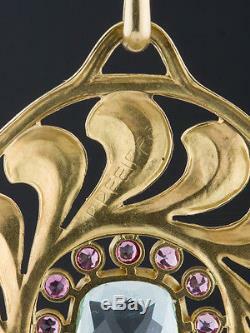 Art Nouveau embodied a new, free feeling of life and a new beginning. 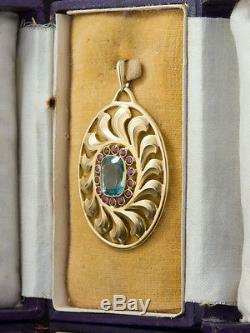 He created jewelry, belt buckles, reliefs, plaques, bust and portrait reliefs and medals. 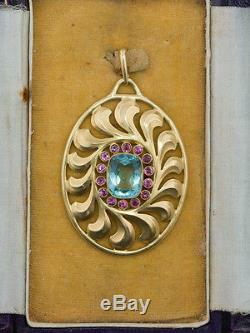 We are proud to present a rare piece of this superb German artist, a natural aquamarine and ruby pendant made and signed by Paul Peter Pfeiffer. 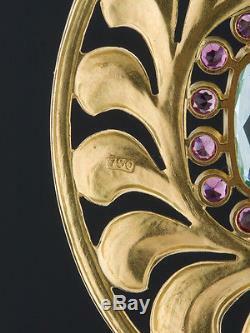 This gorgeous piece is based on leaf motif and is in the manner of the Wiener Werkstatte. Centering is a rectangular cushion cut natural aquamarine of approx 6.37 Ct of a glorious vivid azure colour. Surrounded by a luscious halo of fourteen round cut natural rubies totaling approx 1.18 Ct sparkling with bright pink highlights. This fine example is typical of Pfeiffer style, characterized by soft, curved shapes and lines featuring natural leaves in harmonious design. 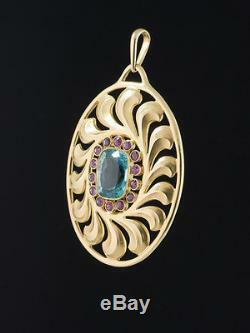 Artfully crafted in 18 Kt yellow gold, marked with assay and signed on the back. Very good overall condition commensurate to use and age. 1 rectangular cushion cut natural aquamarine of approx 6.37 Ct ;14 round cut natural rubies totalling approx 1.18 Ct; (all gemstones estimated on mounting). 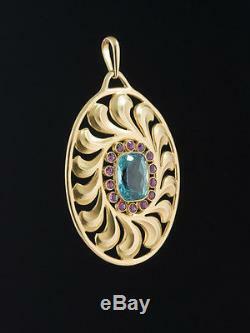 Pendant is 52.8 mm long x 37.6 mm wide; 61.3 mm long including bale. 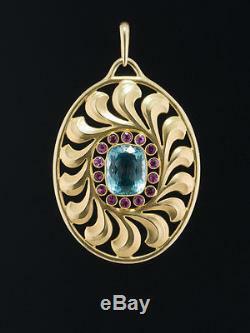 The item "ARTS AND CRAFTS AQUAMARINE & RUBY PAUL PETER PFEIFFER FINE SECESSIONIST PENDANT" is in sale since Tuesday, July 11, 2017. 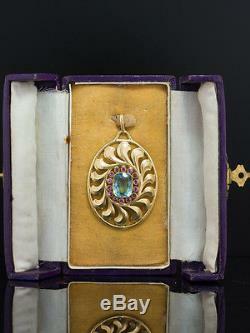 This item is in the category "Jewellery & Watches\Vintage & Antique Jewellery\Vintage Fine Jewellery\Art Nouveau (1895-1910)". 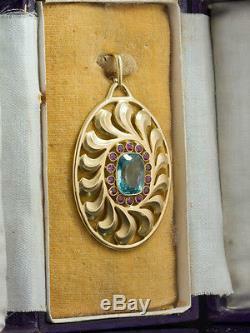 The seller is "antiquevelvetgloves-shop" and is located in London, London. This item can be shipped worldwide.